Good Shepherd's Fold is a children's home for children who don't have parents to care for them. It was a blessing to be with these children and young adults who do not have mothers in the traditional sense of the word, but have many who have loved and cared for them over the years. Damalie, a big sister from GSF, encouraged her brothers and sisters today to love and care for others the way they have been loved over the years. Her comments are backed up by her life, which is spent caring for babies in need. She began her own ministry to babies after she finished her schooling. It has also been a blessing to get to know Claudia who has raised many children in her own home over the years. She has never been married, but has been a loving mother to so many children who didn't have mothers. 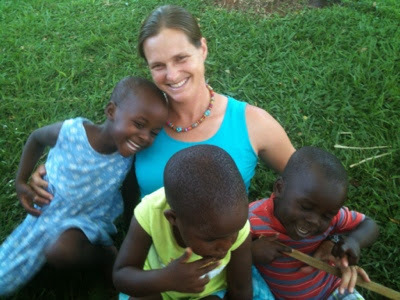 The Ugandan house moms here at GSF also serve as mothers to so many children. Being here has helped me to think of Mothers' Day in a new way. I used to think of how Mothers' Day was a day for moms to be appreciated and given extra hugs. But today as I was sitting next to a little girl who doesn't have a mother, it made me think of how important it is to show motherly love to those in need around you. I have the opportunity to show that love to many children in need of it. 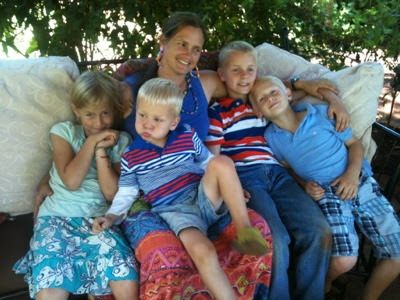 I have started with giving my four children extra hugs today. I also live next door to so many who need to be hugged and told they are loved. While we were listening to a testimony, I decided to take Damalie's advice and put my arm around the girl beside me. There is another young girl who is 4 years old who I hug daily since she lives next door to us. One day I walked over to the playground and she asked me for a hug. Of course I have her a big hug! Then she said that was only 1 hug, and she needed 5. After 5 hugs, she said "That is only one 5, I need many 5s." I decided to hug her as high as she could count. (I helped her counting a bit too. I am a math teacher, and I like to give hugs. It was a win-win.) Soon after all the hugs she ran off to play with other children. I was thankful that God put me there to offer affection to this precious child. As I celebrate Mothers' Day, I want to remember that God gives us many opportunities each day to love those he brings into our lives. We have received his perfect love through Jesus. I pray that he will use me to show His love to those around me.